That's why it's one of my favorite ways to prepare them! Just chop, toss in oil, and place in a hot oven. And voila, you have the perfect accompaniment to any fall or winter meal. My favorite of all oven-roasted vegetables (or fruit, if we're being technical) is roasted tomatoes. Roasting brings out all their yummy sweetness. And in my opinion, even certain vegetables that I don't particularly enjoy when raw or steamed (such as cauliflower), taste wonderful when roasted. It's one simple formula that works for most veggies! Toss in oil (about 2 to 3 tablespoons per pound of vegetables — olive, sunflower, palm, or coconut oil all work) and desired seasonings. Spread vegetables in an even layer on a roasting pan or rimmed cookie sheet. Place in hot oven (about 450 degrees Fahrenheit) for about 20 to 25 minutes. 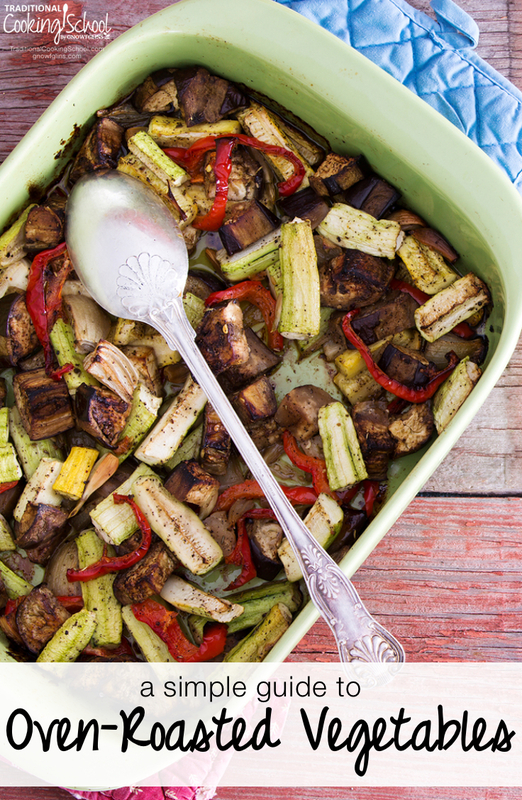 Toss veggies once or twice during roasting, and rotate pan to help them cook evenly. And that's it! Make sure not to overcrowd your pan, since this will prevent the vegetables from browning properly. Also, to create less dirty dishes, skip the bowl and toss the veggies in oil directly on the pan. Below I've included specific instructions for roasting single vegetables. Most are roasted at 450 degrees — so many can be roasted together. It's also possible to tuck veggies into the oven with other dishes at lower temperatures. Just roast for longer! Snap off the ends of the stalks and discard. Toss in oil, salt, and pepper. 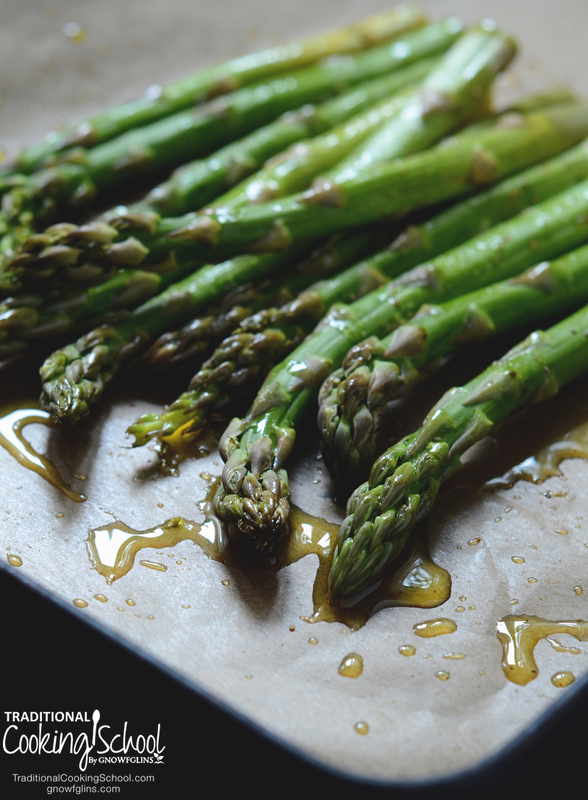 Roast at 450 degrees Fahrenheit for 20 to 25 minutes, or until asparagus is tender. Trim off stems and roots. Lay out a piece of foil and then a piece of parchment paper over the top. Drizzle beets with olive oil and lay beets on top of the parchment paper. Fold up foil and parchment paper around the beets. Roast in oven at 450 degrees Fahrenheit for about 1 hour (or until beets are soft enough to be pierced with a knife). Leave to cool slightly, then use an old hand towel (it will stain) or paper towel to rub off the skins. Cut off the stem and slice into 1-inch pieces. Break the head into florets. Cut larger florets into approximately 1-inch pieces. Toss in oil, salt, and pepper on a rimmed baking sheet. Roast at 450 degrees Fahrenheit for about 25 minutes, or until tender and browned. Cut off ends and peel away any yellow leaves. Toss in oil, salt, and pepper. Roast at 450 degrees Fahrenheit for 20 to 25 minutes. Follow the same directions as for broccoli. Peel carrots. Toss in oil, salt, and pepper. Roast at 450 degrees Fahrenheit for 30 to 35 minutes (depending on size). Preheat oven to 350 degrees Fahrenheit. Place corn directly on the oven rack, with husks still intact. Roast for about 30 minutes, or until corn is soft. Toss whole mushrooms with oil, salt, and pepper. Sprinkle with herbs such as oregano or thyme. Toss again. Roast at 450 degrees Fahrenheit for about 20 to 25 minutes, until mushrooms are golden brown (they will be slightly shriveled, but will still taste wonderful!). 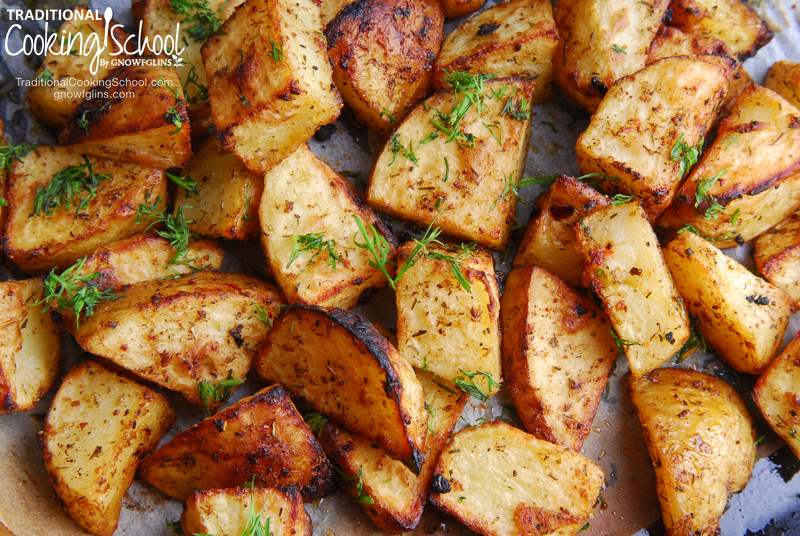 Use whole small potatoes or slice larger potatoes into 1/2-inch cubes. Toss in oil, salt, and pepper. Roast at 425 degrees Fahrenheit until tender and browned (about 30 minutes). Optional (and excellent! ): Toss a few sprigs of rosemary or thyme in with seasonings. Cut sweet potatoes into wedges. Toss in oil, salt, and pepper. Roast at 450 degrees Fahrenheit for 20 to 25 minutes, until tender and golden brown. Use small tomatoes or cut larger ones in half. Toss in oil, salt, and pepper. Spread evenly oven a rimmed baking sheet or casserole dish. Sprinkle with rosemary and place a few pieces of garlic among the tomatoes. I often cook bacon in the oven. When finished, it's easy to remove bacon from the pan, then toss vegetables (like broccoli or cauliflower) in the bacon grease. Place pan back in the oven and roast as directed above. Sprinkle feta cheese over freshly roasted vegetables to add a delicious flavor — and create a sophisticated side dish! Mix it up a little by adding a couple splashes of balsamic vinegar to your veggies along with oil and seasonings. It will give your dish a lovely tanginess. Include a few cloves of garlic with any roasted vegetable to add extra flavor. Once roasted, spread the garlic on some crusty bread for a delicious treat. Experiment with adding different herbs to the vegetables before roasting. Many herbs, such as oregano, parsley, basil, rosemary, and thyme pair well with most vegetables. Do you enjoy oven-roasted vegetables? What are some of your favorites? Do you have any variations to add? My favorite roasted veggie combo is chopped cabbage, diced onions and apple pieces. Toss with melted bacon fat mixed with a little olive oil. Roast at 375 for approx. 20 min (check after 15). Roast until edges of cabbage are browning and starting to crisp. It’s sweet and delicious! Yum! That sounds delicious, Diane. I’m going to try your combo for sure. I also roast parsnips, swede and turnips in a variation of mixed veg you mentioned above. I love roasted vegetables. Roast Tomatoes and garlic still in their jackets for awesome Marinara. Also mix, Fennel, Parsnips, Carrots, Yams or Sweet Potatoes with olive oil, salt and pepper and love this combo but if you have fussy eaters you can glaze them the last 10 minutes with a drizzle of pure maple syrup. I love roasting vegetables. However, I just recently read the post about aluminum foil and how it shouldn’t be heated. I don’t know how else to roast my beets! Any suggestions? Thanks! How about natural parchment paper? I haven’t tried it personally but I was thinking about switching from alum foil and I already bake other things with parch paper. Any one tried that?